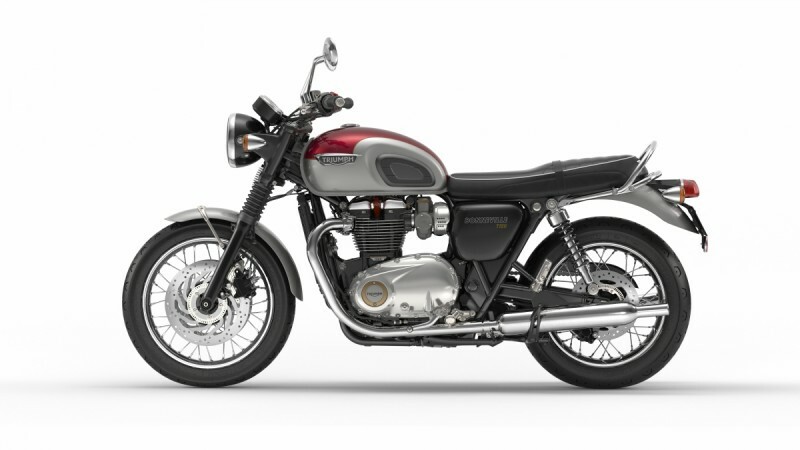 Bonneville T120 is part of Triumph's new range of Bonneville motorcycles, which also include Street Twin and Thruxton R.
Triumph has launched the new Bonneville T120 in India with a price tag of Rs. 8.7 lakh (ex-showroom, New Delhi). The Bonneville T120, which was showcased at the Auto Expo 2016, is also open for booking at the dealerships of the company across the country. The Bonneville T120 is part of Triumph's new Bonneville range, which also includes Street Twin and Thruxton R. The new Bonneville T120, which is built around the tubular steel cradle frame measures 2,170mm in length, 785mm in width ,1,125mm in height and has a wheelbase of 1,445mm. It comes with a seat height of 785mm and weighs 224 kg. Powering the Bonneville T120 is a 1,200cc, 8-valve, fuel-injected, liquid-cooled, parallel-twin engine, which is tuned to dish out 79bhp of power at 6,650rpm and 105Nm of torque at 3,100rpm with 6-speed gearbox. Offered in four colour choices â€” black, red, red and aluminium sliver and black and white, the bike features LED rear light, under-seat USB socket, day time running headlight, twin feature clock and heated grips. The safety features include traction control, ride-by-wire and anti-lock braking system (ABS). It also gets two riding modes â€“ Road and Rain. For the Bonneville T120, Triumph offers over 160 accessories such as leather-stitched seats, throttle body embellishers and triumph tank badge.